The Hotel Locarno features a rooftop terrace overlooking Rome's historic centre. Offering free bikes and free Wi-Fi, this property has rooms with an Art Nouveau style. In fine weather, a generous buffet breakfast is served al fresco in the furnished patio. In the afternoon and evening you can also enjoy a drink at the Locarno's bar, also open to the public. 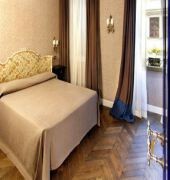 All air conditioned, en suite rooms at the Locarno Hotel come with fine fabrics, a TV, safe and minibar. Some rooms are located in the annex building in front of the hotel. A 4-minute walk away, Flaminio Metro Station offers direct connections to the Vatican City area and Termini Train Station. The Spanish Steps are 850 metres from the Locarno. The LOCARNO is a Tourist hotel. Located in ROME area. Shopping is accessible by bus/taxi and the nightlife/restaurants are located in the hotel. Descriptionclass="small" style="text-align: justify; font-size:11px;">The Hotel Locarno features a rooftop terrace overlooking Rome's historic centre. 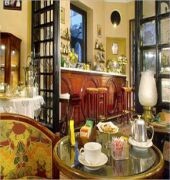 Offering free bikes and free Wi-Fi, this property has rooms with an Art Nouveau style. In fine weather, a generous buffet breakfast is served al fresco in the furnished patio. In the afternoon and evening you can also enjoy a drink at the Locarno's bar, also open to the public. All air conditioned, en suite rooms at the Locarno Hotel come with fine fabrics, a TV, safe and minibar. Some rooms are located in the annex building in front of the hotel. A 4-minute walk away, Flaminio Metro Station offers direct connections to the Vatican City area and Termini Train Station. The Spanish Steps are 850 metres from the Locarno. Thank you for your wonderful review regarding your recent stay at the Hotel Locarno. We are thrilled to read that your expectations were not only fully met, but surpassed for our friendly and helpful staff, outstanding restaurant, ideal location to join different destinations nearby, beautiful rooms and last, but not least the lovely wisteria in our popular courtyard. We all look forward of welcoming you back very soon. We stayed 4 days in Hotel Locarno and liked everything there. 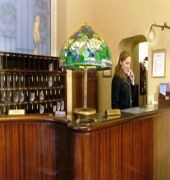 The staff was very friendly and helpful, the room nice and quiet, and the location was top. We like particularly the breakfast, which we considered quite inexpensive. All the atmosphere in this hotelis exciting, the hotel is both, old fashioned and modern, and we enjoyed our stay very much. When coming back to Rome, we definitely will choose this hotel again! Thank you for taking the time to write your feedback regarding your stay at the Hotel Locarno. We very much appreciate all your positive comments about our ideal location, our staff and room allocation. We are also very happy to read that you enjoyed our freshly made breakfast and the unique style of the Hotel Locarno, well known all over the world. We look forward of welcoming you back in the nearest future. 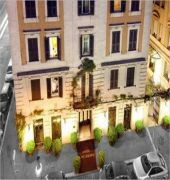 Tucked in a quiet street behind the Piazza di Popolo, this is a delightful, reasonably priced hotel as Rome hotels go. The location is awesome, just around the corner to Romes best shopping. Lots of restaurants nearby. Superb staff, nice bar, renovated rooms. 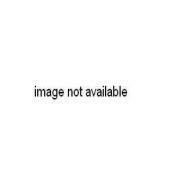 Couldnâ€™t have been happier. It is a pleasure to read your comments about your recent experience at the Hotel Locarno for your stay in Rome. Our Guests satisfaction is our number one priority and we are glad to learn that everything was superb: the hotel, the staff and our perfect location. Looking forward to welcome you back for a longer visit, we do remain at your complete disposal. Just arrived and couldnâ€™t be happier! Staff is friendly and so helpful. In fact, theyâ€™ve been very helpful before my arrival. I had a few questions and things that needed arranged and theyâ€™ve been prompt and helpful. Perfetto! Iâ€™ll post another review at the end of my stay. Thank you for choosing the Hotel Locarno! It has been such a pleasure to welcoming you and we hope that you are having a fabulous time in Rome. We are at your full disposal at the Reception for any assistance you may need during your stay with us. We were staying over the road in the Hotel Anahi (see seperate review) but the added bonus was that if you stay at Hotel Anahi, you have your breakfast "over the road" at the fabulous Hotel Locarno. In fact on the day of our arrival, we went to Hotel Locarno for a drink before dinner. There is a stunning courtyard area (where my brother and sister-in-law had taken up residence) with plants and decor, and heaters for the cold evenings. This area has a very classy, laid back feeling with an excellent (and bizarrely named) cocktail menu. It's a great venue and worth checking out even if you are not staying at the hotel. It's also well located, only a short stroll from the Piazza di Popolo. As for the breakfast, absolutely superb! Huge range of choice, and wonderful service both in the restaurant and bar. The place is so good we even sneaked back for afternoon day one day (back in the courtyard of course). Make no mistake this is a classic venue. Interesting architecture aswell. We are looking forward to staying there properly! Thank you for taking the time to write your feedback regarding the Hotel Locarno. We very much appreciate all your positive comments especially about our unique courtyard and our freshly made breakfast. Our Lounge Bar is one of the best in town; our barmen are always tempting our Guests with their creative art of Mixology. We look forward to welcome you back in the nearest future...hopefully as a Value Guest of the hotel too!